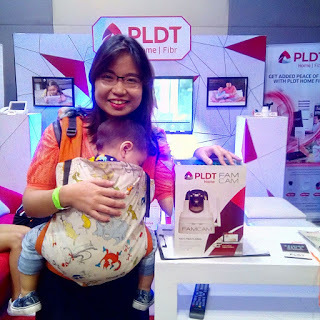 My little family arrived at SM Aura's SMX Convention Center a few minutes before the event started last September 9. Raising Gen Z was packed with useful information. 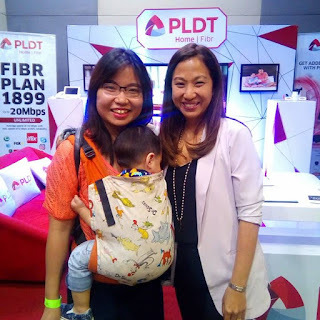 I'm thankful to Mommy Lani of Mommy Bloggers Philippines for inviting us here. Seven of the eight speakers came. Tony Meloto of Gawad Kalinga was unable to come due to an emergency. I was actually looking forward to that having known him through my years of leadership in Youth for Christ and Gawad Kalinga, and well, his talk was about raising Filipino men. 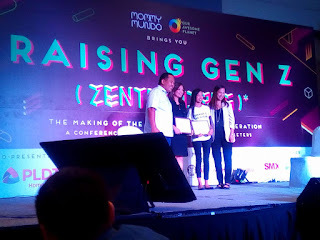 I was particularly excited about this event because while I had been called a "mommy expert" a few times, I have to admit that I get clueless at times. Nothing will ever prepare us for parenthood, even if it's your 2nd, 3rd or 4th child, because every child is different. Popy is now 2 years old, and our daily life together is always full of surprises. Sometimes, the surprise comes in filled with a lot of hugs, kisses and laughter. 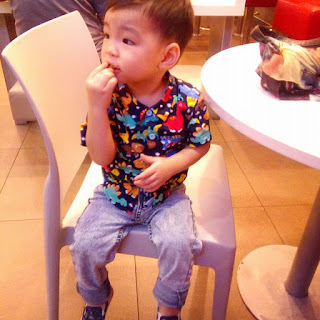 Sometimes, it's filled with tantrums, cries, kicks, and bruises or broken lips caused by my son's sudden movements (like that one instance he slammed his head on my mouth that left me bleeding). While I'm writing this, Popy is crouching beside me, watching an educational video about colors on YouTube. On normal days, mom guilt seeps in the cracks. I am successfully breastfeeding him for the past 26 months. We've used cloth diapers. We've fed him healthy food. We've worn him in ergonomic carriers. But as a yayaless wahm, keeping him off technology is futile, considering that I spend 12 hours working online. I'm probably not the best example to him. I give him toys and he reads his books, but on a last resort I give him my phone or my laptop, so he can watch his shows and stay quiet while I finish my work. 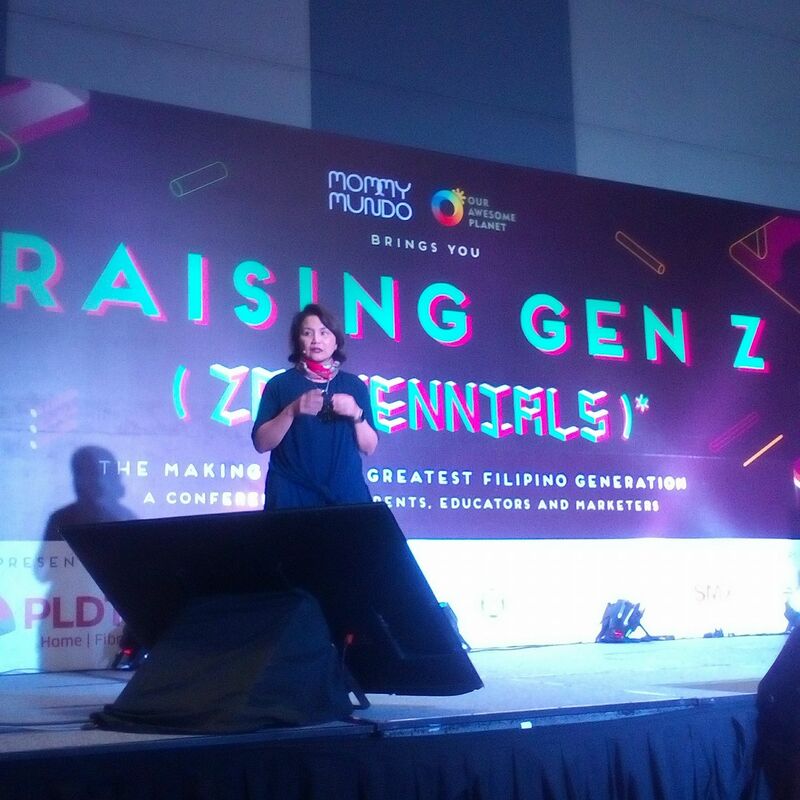 Didi Manahan of Keys School Manila Inc.
How do you see the new generation? "Beyond stereotypes" was mentioned by Didi Manahan of Keys School Manila. I'm sure you've heard the half empty or half full expression. I always look at things half full. I love how the speaker said changed the view of kids nowadays being tech addicts to tech natives, because hey, they were born in this age. These social media plaforms, YouTube, computer games - these were all present the moment they were born, so it's not unlikely that they'll be so into it. Gab and I were both amazed that some schools are already teaching robotics, to think that our first computer subject was probably in 4th or 5th grade. They don't even have floppy disks anymore! It's praiseworthy what kids can do when we teach them how to use technology responsibly. Aside from robotics, kids can now create games, apps and websites! Take Isabel Sieh of Girls Will Code, for example. I was already 16 when I learned C++ coding in my 4th year high school Computer class, but I never took it to another level; and here's this 13-year old girl who's even teaching public school students how to code! Mom and daughter pair, Ronna and Isabel Sieh. Isabel founded Girls Will Code. Dad and daughter duo, Anthony and Hannah Pangilinan. Hannah is a YouTube Vlogger. I didn't know the Pangilinans were great speakers. My mom knows, apparently. I've been under a rock all this time. Hahaha! "Be generous with your praises!" Anthony said. Now, that I'm a mommy, I've encountered a lot of moms worried that their children still do not know how to close-open, align, clap your hands, etc. 1. Do you teach them these? - Personally, I never taught my son these things on repeat, so he won't clap his hands when you just tell him to do so. He will if he's really happy. They're cute, yes. No offense meant to those who teach these actions. It's really great. But if you're a parent whose child still doesn't do these, there is no need to feel that they are developmentally behind. There is totally nothing wrong with that. 2. But what does he already know? - Why do I ask this? Because sometimes, we're too focused on "oh, he doesn't know how to clap or align..." that we fail to see the things that he already knows. I spoke to a mom one time. Same dilemma. She has friends and relatives asking why her baby doesn't clap her hands when they tell her to. After a bit of probing, I found out she doesn't teach this. Later on, after asking her what her son knows, she realized that her 1-year old son already knew how to brush his teeth and comb his hair. We can try to address the areas where our children falls short, but never fall short on praising them for what they're good at. Apparently, I am a millennial mom raised by boomers who is raising a gen alpha. I thought my son's included in Gen Z. She keeps up with the times with these terms, maybe because she's in advertising. :) I feel so tita already. But a gen alpha! That sounds like a huge responsibility. My alpha on lunch break. This is Popy. My alpha. The one who accompanied me in every event for the past two years, including processing my MAT benefits from SSS. Between my husband and I, I'm the one who's more relaxed in parenting. My husband's the panicky protective half. I used to tell Gab, if Popy climbs a chair, you don't tell him no. You go behind him and support him or catch him if he makes a wrong step. Then you teach him the right way to climb and encourage him to try again. I see a lot of potentials in children, in general, not just mine and given the right tools and information, we have the power to hone their skills, their talents, their passions... Let's allow them to try. Let's allow them to observe, act, make a mistake and stand up again. And let us be the kind of parents who are there for them whether it's a victory or a loss. I like the freedom. I love the trust I give him. I love that, because my Popy is from a different generation, I am able to learn something new everyday. After all, my boomer parents, I'm sure have imparted boomer parenting skills on me, too. Like every child, every parenting way is different. Today, I have this power to raise my child to be passionate and happy and productive. How are a you raising your kiddos? This is actually a really great concept and I am really regretting not being able to attend due to a family emergency. :( I hope they do another run! I'm glad I'd be able to read some snippets from your sharing. Sayang I missed this event as I have a staycation on that day. 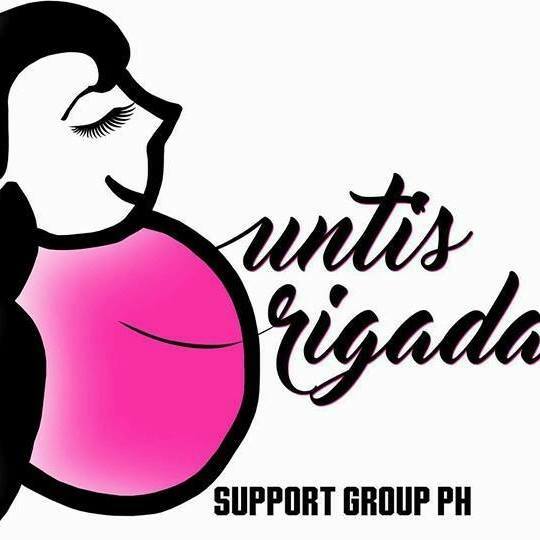 I wish to attend events like this that helps us new parents in raising our kids. And yay! you're too lucky, you've won a PLDT FamCam. I wanted to attend this event but I had some conflicts in schedule. Sayang! But I agree with you on this statement: "...if Popy climbs a chair, you don't tell him no. You go behind him and support him or catch him if he makes a wrong step. Then you teach him the right way to climb and encourage him to try again." Sometimes, we tend to think that our kids automatically know what to do when in fact we still have to teach them. Wow, nice, you won pala! Congratulations, with you as the wise and strong-willed mom, your son will definitely be an alpha. 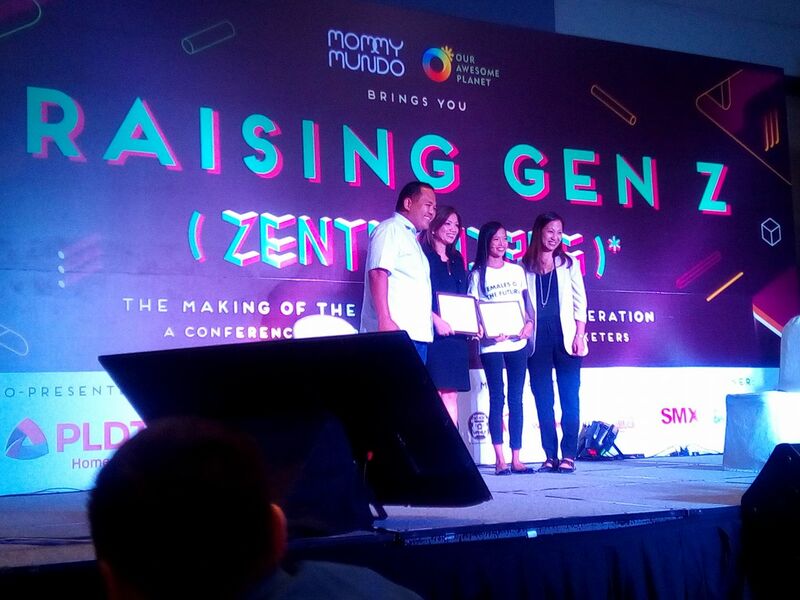 Missed this event coz I, too, have Gen Z kids. I hope the organizers will come up with another one coz I'll surely won't miss it next time!